The baby does not need to be in the middle. One of the biggest safety measures that is recommended for co-sleeping families is that the baby sleep between the mother and the wall – not in-between both parents. A bed rail enables this to happen even if your bed is not (or can not be) up against a wall. Travel becomes easier and safer. Traveling with co-sleepers has its ups and downs, depending on the situation. Even if your child is old enough to safely sleep in between both parents, it’s sometimes nice to have them on the outside and a bed rail makes this possible. I have never flown with a bed rail, so I do not know the complexities of that, but I have thrown it in the trunk on many occasions and have used it in hotels and family homes. It has made travel much easier because I never have to worry about moving a bed up against the wall (which is often not an option, especially at hotels). You don’t need to have your bed against the wall. Safety-wise, a bed up against the wall is probably still better. However, logistically speaking, this can be very difficult, if not impossible in some rooms and situations. This is especially true when traveling. You can have two children in the bed. Another big safety measure that is recommended with co-sleeping is that siblings never be next to each other. Since young kids tend to be able to sleep through just about anything, this makes sense. However, if you’ve got multiple kids, you may want (or need) to leave the option open for others to join you. This is one of my favorite parts of having a bed rail – you can have one child in between you and the bed rail and the other in between both parents. When awake, they can fall over the bed rail. This was one of my biggest concerns (if not the biggest) with the bed rail and it had nothing to do with co-sleeping. The issue is that when they are awake, if not properly supervised, they could launch themselves over the bedrail. My daughter would naturally grab it and pull herself up, so I learned very quickly that she could never, ever…ever be on that bed alone. We still leave our mattress on the floor (this is my biggest recommendation to co-sleeping parents), but it still made me nervous, so if you end up opting for a bed rail make sure you are very, very vigilant even after your child is awake. If used improperly, a small baby could get stuck in between the bed rail and bed. One of the most important safety measures when co-sleeping is to ensure that there are no gaps or crevices anywhere, and this certainly includes the bed rail. A properly installed bed rail should be flush up against the bed with no ability for the baby to fit in between the two. As long as you check it each night, you should be ok. This is especially true if you are using a bed rail on a mattress that is flat on the floor (*more on that below). No bed rail is made specifically for co-sleeping. When I started looking for a bed rail, I couldn’t find a single one that was meant for co-sleeping. 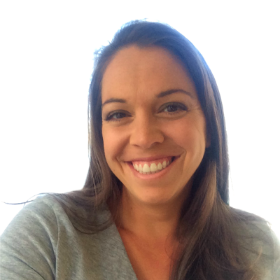 Quite the contrary, actually – every single one specifically says that you should not use with infants under the age of 2. This isn’t too surprising when you consider it from a liability standpoint, but it means you need to be extra careful. They are not designed specifically for infants, so you need to be vigilant and take safety into your own hands. If you decide to use one, make sure you examine it and play around with it first to understand how it works and where any hazards may be. Can a Bed Rail Work with a Mattress on the Floor? One of the best pieces of advice I will give to any co-sleeping parent is to remove your bed frame and box spring and put your mattress directly on the floor. This is such an easy move to make and it eliminates one of the main risks of co-sleeping: your infant or child falling from the top of the bed to the floor. This is a common move for co-sleepers, so I’ve seen this question a lot – can you use a bed rail if your mattress is on the floor? The short answer is yes. My mattress is on the floor and we’re using a bed rail. However, just like bed rails are not make specifically for co-sleeping, they are also not made for mattresses that are right on the floor. It’s possible that this is for liability reasons, but also may just be because most people use box springs and bed frames! So you need to be careful what bed rail you choose and you need to play around with it to make sure it is still secure. Co-sleeping with a bed rail does not eliminate any of the risks that are already present with co-sleeping. 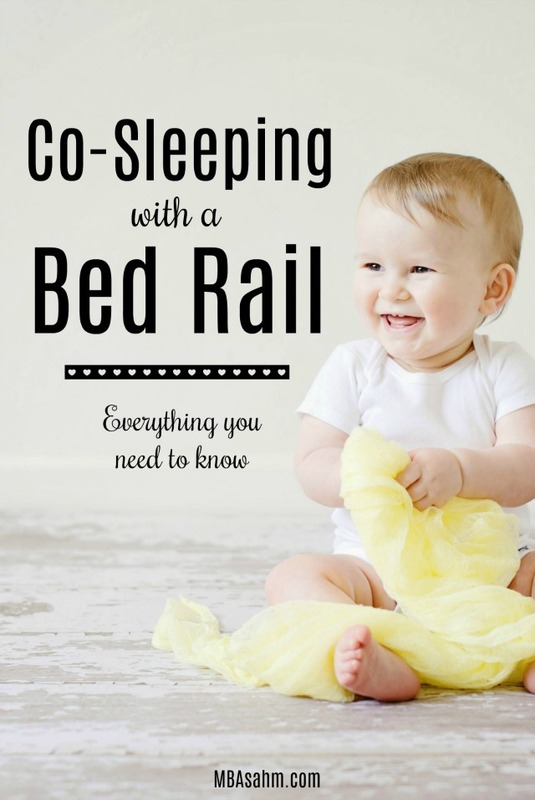 If you’re already a seasoned co-sleeper and know the precautions you need to be taking, then a bed rail may be a good addition to your sleep arrangements. If you’re new to co-sleeping, though, don’t assume that a bed rail is a quick fix or that it somehow eliminates the risks present with co-sleeping in general. Check your bed rail each and every night to make sure it’s positioned properly. The bed rail can move, especially after everyone’s been in and out of bed, so check it every night. The mechanisms that allow it to bend back and forth may also have been accidentally triggered, so check that they are tightly in place each night. Make sure there isn’t a gap at the top of the bed. You need to put thought into where the bed rail is placed, so make sure there isn’t a gap at the top of the bed that is large enough for your baby to fall through (especially if your child tends to scoot up at night). The age of the baby makes a big difference. The younger a baby is, the higher the risks, even with a bed rail. No drugs, no drinking. Bed rail or not, heavy drinking and drug use increases the risk of an accident happening with co-sleeping. A bed rail does not eliminate this risk. No heavy sleeping. Unfortunately, if you’re naturally a heavy sleeper, co-sleeping may not be a good idea. You need to be very attuned to your baby’s movements throughout the night, even (if not especially) with the addition of a bed rail. No “stuff” around the baby. Eliminating pillows, blankets, and stuffed animals around a baby is important when you’re co-sleeping. Again, a bed rail doesn’t eliminate this risk, so it is still an important measure to take. Young babies should be on their back. This can be hard if you have a baby that naturally turns over, but it’s a good way to minimize the risks of SIDS or suffocation. This is highly recommended when babies are in cribs and the same is true if they’re with you in your bed. I hope some of this information was helpful! Good luck to you. I love all the variances in co-sleeping. It makes me so happy to think of parents enjoying their littles and everyone feeling safe and loved! My husband (who typically spends the first few weeks on the couch so that I can have the whole bed for sprawling with the newborn) just moved back in and so our newest is now in a co-sleeper right next to me. 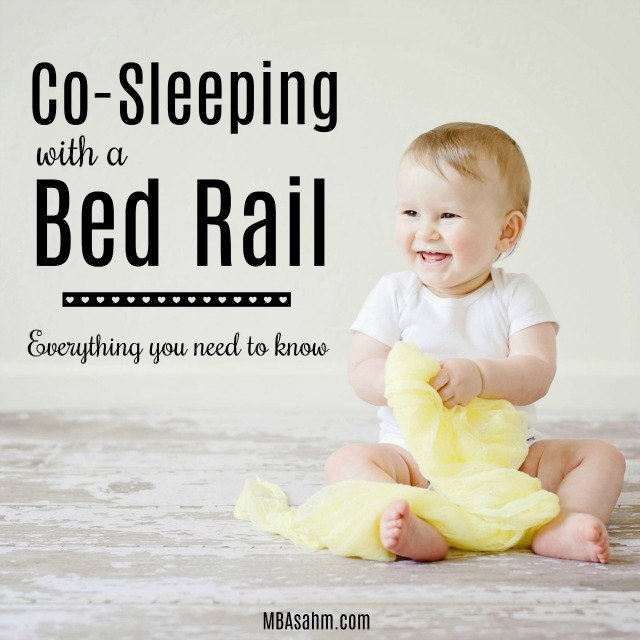 I don’t think many people are aware of the bedrail idea for cosleeping.